I haven't the faintest idea of where to begin. Tried Lab color, CMYK method and a bunch of other tools but I'm just trying things at random. A while ago I seem to remember a similar problem but a search didn't help at all. Went through a couple of texts, same result. How does one retouch a penguin's black nails to look as if they were painted with a red fingernail polish befitting a penguin? If the penguin had been kind enough to have her nails painted any color but black, I don't think I'd have much difficulty making the change on my own. The thread "Metallic Glow?" was very timely and the help offered there is terrific, but I'm stuck on something. I'm currently working on this photo. 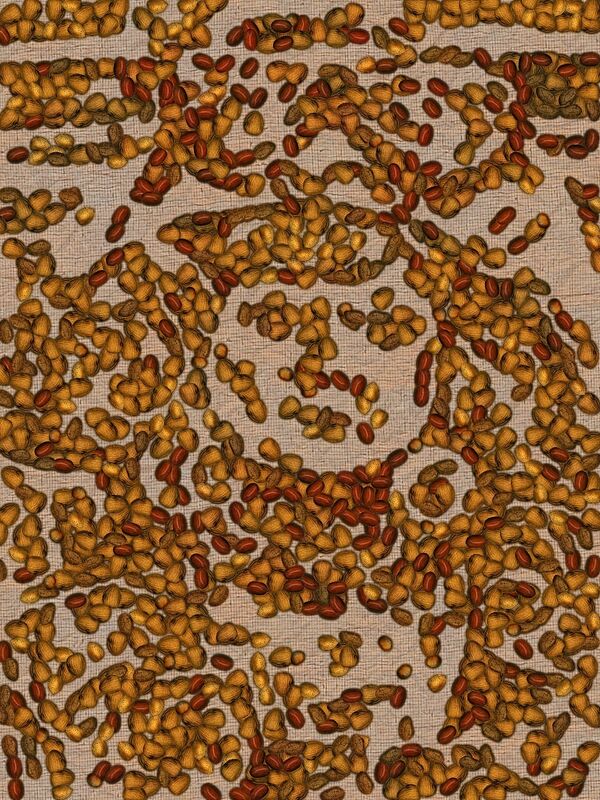 I am trying to create a mosaic of a photo with seeds and nuts (not in photoshop). The plan is to project a simplified projection of the photo onto the floor and number every color. when I transform the photo into a similar picture, I can sort the nuts and seeds by color and number to make the whole project managable. If anyone else has a better method for this let me know please. It's not entirely clear to me what you are trying to do. Are you trying to turn the Photo into a line drawing (and then add numbers to the different areas) – like your example? If so the best result would come from manually constructing the lines (e.g. with the pen tool). Illustrator will be a better choice for software if you are familiar with it. 1. A little bit of Median (or blurring filter). 4. Desaturate and pull in black point. You could also try Live Trace in Illustrator. That might be better. Last edited by Chain; 01-19-2012, 07:59 AM. What i want to achieve is not a line drawing but a way to reduce my photo to less colors (25-50 colors) and number each color area in the photo. This way I can search a seed, nut or fruit that matches each color. 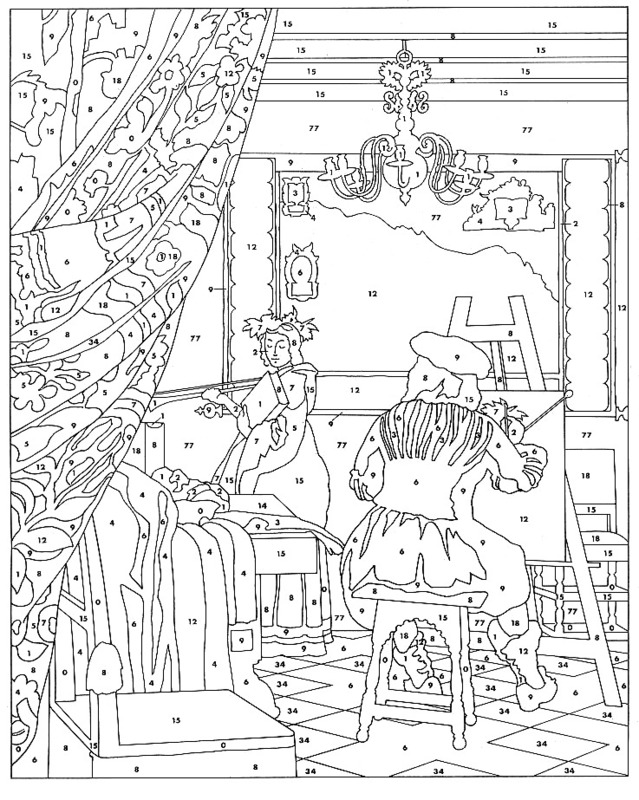 I can then project this image onto a surface and start "coloring" sort of like the painting by numbers. In PS try FILTER - TEXTURE - STAINED GLASS and adjust the cell count to the detail required then use colour picker to get the colour mix numbers. You could also try what I suggested, but just do steps 1/2, and increase the amount of colours/levels. Numbers you will have to add manually though, so with this large amount of colours that will be huge job. Perhaps you could project one colour at a time; then you won't need to number them? (Also, if you use the Illustrator method, you can output the colours to easy-to-manage swatches). Chain and Repairman both have good ideas. If you are just projecting an image for a project, here is another approach including how to insert numbers in (or any identifier that you want). Now I used an awful example for the experiment yet this should give you one idea of how to approach the problem. Hope this helps. Used Darknock's Canny preset for the outline. Sorry; couldn't help myself. Won't show a preview, but click for this doll as template for nuts (not the template as I showed previously; used a complete different template to be more DAP friendly).